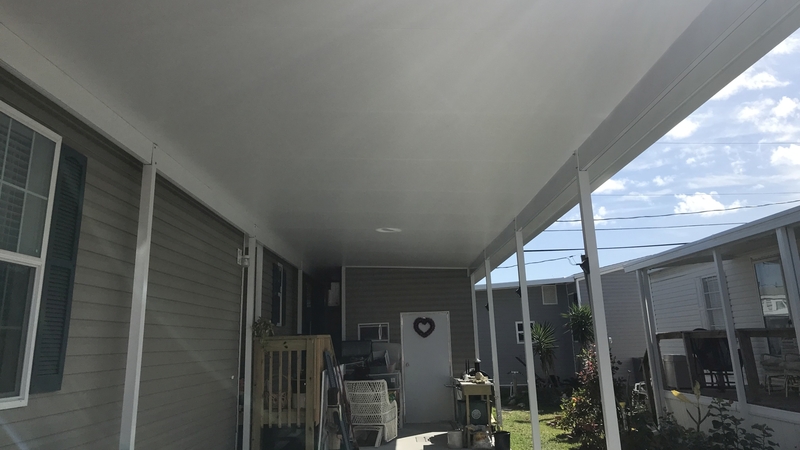 This mobile home carport roof replacement solved a Central Florida customer’s problem of leaking water caused by poor design. The original roof had to be taken completely apart because the original installation did not have proper pitch for draining. The carport roof leaked every time it rained! We replaced their pan roof with insulated panels normally used on screen rooms. The replacement roof was installed at a steeper angle by lowering everything 3″ and solving their problem with better run off. Do you have a similar roofing replacement problem? Call 321-978-5500 for a quote.